RECOUP Research and Education Foundation is the educational wing of Sharanam Charitable Trust. RREF Courses and workshops are famed for world class faculty and providing intensive, practical training with immediate clinical application. DN is a skilled intervention that uses a thin filiform needle to penetrate the skin and stimulate underlying MTrPs, muscular, and connective tissues for the management of neuromusculoskeletal pain and movement impairments. DN is a technique used to treat dysfunctions in skeletal muscle, fascia, and connective tissue, and, diminish persistent peripheral nociceptive input, and reduce or restore impairments of body structure and function leading to improved activity and participation. How movement and play stimulate learning, feelings, and sensations toward oneself and the environment resulting of new pathway in the nervous system. 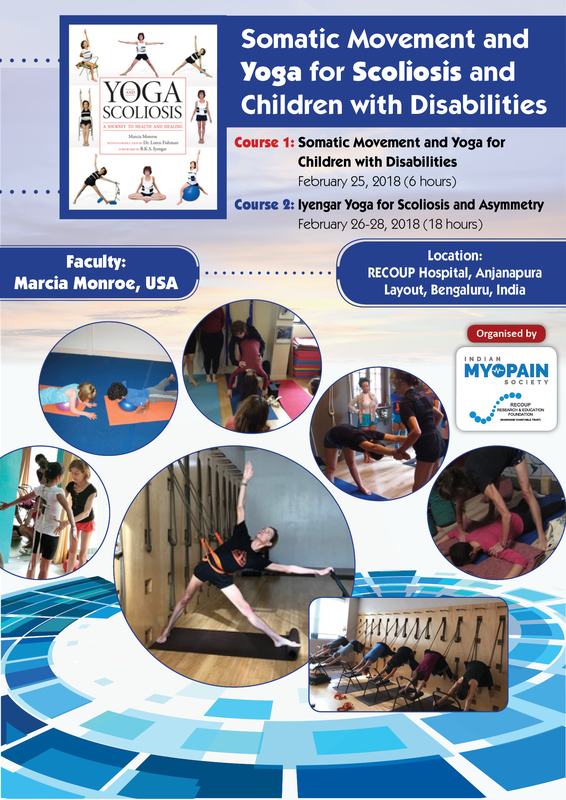 The contents of the course will be a somatic approach of developmental ovement patterns drawn from school BMC in the USA, and their relationship to Yoga postures. All surgeries lead to adhesions between the skin and underlying structures. This can disrupt the normal gliding between the structures, and can affect normal function. Adhesions are expected to cause abnormal afferent input to the central nervous system, leading to altered control patterns. Disrupting the adhesions and facilitating normal healing should allow the tissue functions to return to normal. 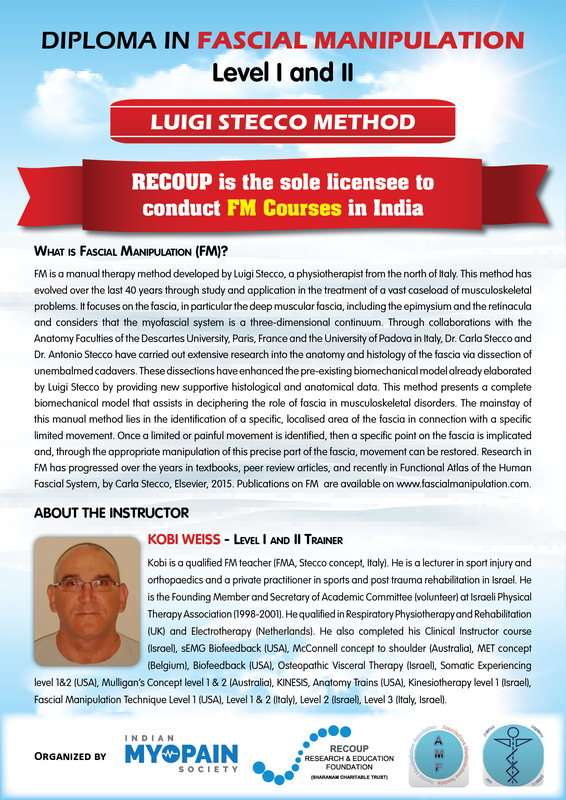 FM is a manual therapy method developed by Luigi Stecco, a physiotherapist from the north of Italy. This method has evolved over the last 40 years through study and application in the treatment of a vast caseload of musculoskeletal problems. It focuses on the fascia, in particular the deep muscular fascia, including the epimysium and the retinacula and considers that the myofascial system is a three-dimensional continuum. 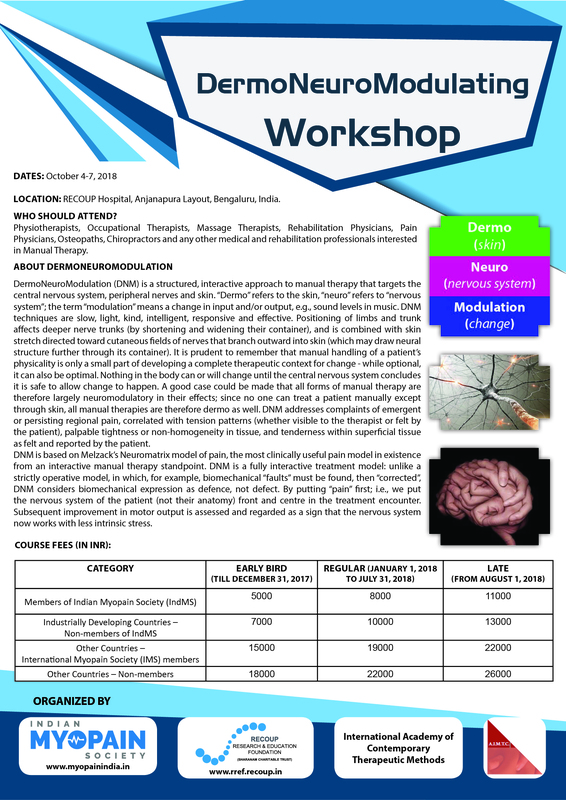 DermoNeuroModulation (DNM) is a structured, interactive approach to manual therapy that targets the central nervous system, peripheral nerves and skin. “Dermo” refers to the skin, “neuro” refers to “nervous system”; the term “modulation” means a change in input and/or output, e.g., sound levels in music. DNM techniques are slow, light, kind, intelligent, responsive and effective. The Niromathé® method (www.niromathe.com) was developed in 1997. The manual technique involves traction of the skin while stimulating the tenso-modulator elements which could be similar to the myofascial trigger points. It is easy, painless, for everybody (from the infant to the elderly), quick (15-20 minutes or less), practical, and very efficient with immediate results. The primary objective of the Trust is to spread awareness about the advances in medical management and bring it within reach of every Indian with a locomotor disability, irrespective of socioeconomic status. 1. To establish, promote, set-up, run, maintain, support hospitals, nursing homes, clinics and other similar institutions or centers for rendering or providing medical treatment, care, rehabilitation, and relief and/or aid to the physically or mentally challenged or less abled persons. 2. To give, provide and/or render help and assistance in cash or kind or in any other shape or form including food, shelter, clothes and medicines to the needy, poor and deserving persons undergoing such medical treatment, care and rehabilitation. 3. To aid research in all disciplines of medical sciences for better management of locomotor disabilities. 4. To organise and aid camps, seminars, workshops, meetings, national/ international conferences, web based and distance learning educational programmes, and using mass media to disseminate information and create awareness among sufferers, medical fraternity and related professionals regarding researches and modern advancements in diagnostic, medical treatment, surgical intervention and rehabilitation techniques. 5. To publish media material to disseminate knowledge on prevention and treatment of locomotor disabilities. 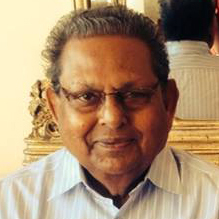 Mr. Bijoy Sharan is the founder of Sharanam Chritable Trust. 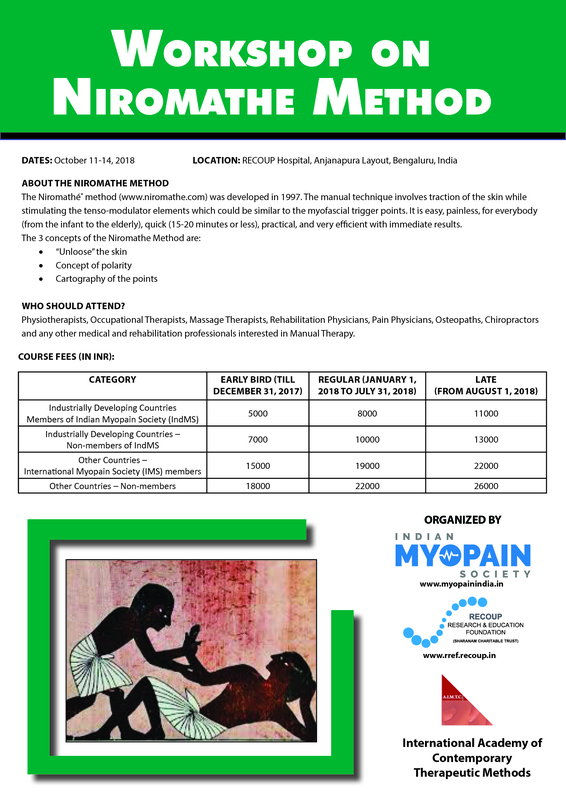 Dr. Deepak is the Medical Director and Owner, RECOUP Neuromusculoskeletal Rehabilitation Centre. He is the winner of 2008 National Disability Award; 2012 Henri Bensahel Award (the World’s highest research award in Paediatric Orthopaedics) and 2016 Silver Jubilee Oration (Indian Orthopaedic Association) for developing SEMLARASS for cerebral palsy; Advisor on Cerebral Palsy to Govt of India. Holds a Graduation and Post Graduation Degree in Physiotherapy, specialized in Neurology from Dr. M.G.R. Medical University, Chennai. 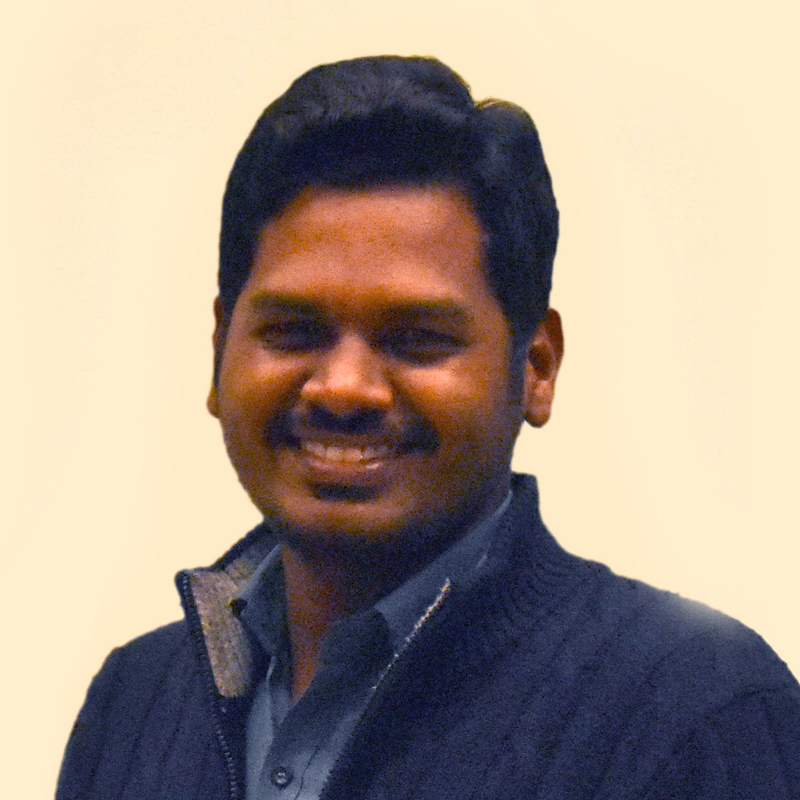 Joshua Samuel has produced over 50 scientific publications and conference presentations at State, National and International level. He has around 5 years of Clinical experience in Paediatric and Adult Rehabilitation. He was awarded the “Student Doctor Grant” in 2013 from the prestigious Oxford University, UK for the article on “Enriched Environment”, peer reviewed by British Medical Journal (BMJ) and Centre for Evidence Based Medicine (CEBM). He was the only Post Graduate Physiotherapy student to represent India from the15 students around the world.